I’m not a big fan of debt consolidation. I like how Dave Ramsey refers to it as “Debt CON-solidation” because it’s typically some type of scam to make more money. But this is essentially what I’m considering now. Let me back up to explain…. I want to pay off my debts ASAP! The loan forgiveness period requires 10-years of on-time payments. I want my loans to be gone WAY before that!!! I distrust the service. Simple as that. Who’s to say it won’t be cancelled or eliminated by the time a decade rolls around? This is the first year that people were supposed to qualify for loan forgiveness and I’ve read all kinds of horror stories of people who ended up screwed over for one reason or another. Not to mention, I owe the money so I’d like to pay it back. On a moral level, I feel an obligation for taking out these loans and I want to repay them myself. Looking for a fun way to make some extra money? Try Heart Bingo today! So that’s the reason why I haven’t – to this point – ever tried to enter into a PSLF program. But I’ve got to be honest here. We are drowning under high monthly payments. Between the money we owe the IRS, our new credit card debt, student loan debt, and our normal household bills – we have so much outflow that keeping up with my $550/month Navient payments has become a real burden. Like….I don’t know if we can do it. You can’t squeeze blood from a turnip. We just don’t have the money! I’ve been working and working on our household budget and it’s just a total mess still. So I decided it might be worth looking into the PSLF program a bit more thoroughly. I called Navient (my loan-holder) and did a bunch of additional research on studentloans.gov. Even though I’m currently in an income driven repayment plan, the way the PSLF program is designed, it requires all loans to be consolidated into a single loan. Why? I don’t know. Makes no sense to me. I was told that’s the rule from an employee at Navient and verified from studentloans.gov (side note: there is an exception – I was told I wouldn’t have to consolidate if I chose to move to a 10-year fixed repayment plan. BUT….I don’t get why anyone would do that because the PSLF doesn’t kick in until 10-years after on-time payments. SOOOOO, if I’m in a 10-year repayment plan….then at the end of 10 years there’s nothing left to be forgiven because everything has already been paid. Someone please clarify if this is wrong. This is what Navient told me and it blew my mind. I still don’t get how that makes any sense. Not to mention, a 10-year plan would put my payment over $900/month, so that’s not really an option for us right now). So I decided to check out the application and just gather information. Here’s what I discovered. If I consolidate my loans to a single loan that qualifies for PSLF…. My monthly payment will lower by about $100-150/month, depending on the type of repayment plan I select. I intend to stay in academia, so I don’t think there’s any reason to worry about moving jobs outside a field that would disqualify me for PSLF. BUT, if I enter into the consolidation and end up getting our finances under control and want to pay off my debts in full, I’ll end up paying hundreds (thousands??) extra due to the higher interest rate and lower monthly payments. The idea of relying on this program still leaves a bad taste in my mouth. Not to mention, if any debt is discharged, I know I’ll owe taxes on the amount that is forgiven (so there’s still a “catch” after all that). BUT, it’s really appealing to me to have a lower monthly rate locked in and know that I’ll be DONE in, at an absolute maximum, 10 years total. 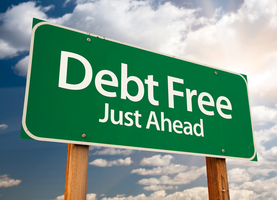 I know that’s still a very long time and I want to be debt-free well before that….but it gives a permanent and definitive “END” date that I haven’t had up to this point. Is anyone else participating in a PSLF program (or a similar loan-forgiveness program)? What are your experiences like? What are your thoughts on these trade-offs between a lower monthly payment and higher overall interest rate? What would you do if you were in my shoes? I don’t have any advice, but did want to note that according to the Federal Student Aid website, the amount forgiven would not be taxable. I do know that my daughter is a teacher and used the loan forgiveness program she was eligible for after teaching in a low-income school for 5 years and she was not taxed on the forgiven amount. Long story short: I’m eligible for PSLF because of my career as well, but previously consolidated most of my federal loans under a different program when interest rates were very low (mine were locked in at 4.63%). Therefore, only one of my current loans qualifies and it’s due to be paid off before the 10 year limit anyway. Like you’re considering, ultimately I decided not to go the PSLF route because I decided I could pay off my loans faster and save more money in the end since all my interest rates are less than 5%. My advantage is that it’s just me—no family to worry about. I did recently come across a couple of really good resources regarding options for paying back student loans that I wish I’d known about years ago, and you might find the, helpful as you consider your options. https://www.physicianonfire.com/loans/ — This is a resource page from a blog written by a doctor with links to lots of articles written by other doctors with high levels of student loan debt. So, some of the options they discuss are for former med students only. But a lot of the information is relevant for anyone with high levels of student loan debt. https://thecollegeinvestor.com/ — The guy who runs this blog has just started a new challenge this month to get participants to pay off $1 million in debt, cumulatively. He’s calling it the Student Loan Debt Movement and he has lots of information and background on different options available. Good luck wading through all the options and figuring out what will be best for you! Whenever I have moments where I question my chosen method of repayment, I just remind myself that I have a plan and am moving forward. It might not be the “optimal” plan according to some people, but it works for me, is something I can stick with, and I’m able to see progress and, ultimately, the end of loan repayment. I have absolutely no qualms about using debt forgiveness from a moral or ethical standpoint. The med school I went to (a state school) had a built in promise to forgive 1/3 of your tuition if you did primary care in the state for 4 years after graduation, and I absolutely took advantage of it. It was a different type of program, so I never made any payments and the $$ was cancelled at the end of it. I never felt it was wrong or not living up to your responsibilities; it’s a program designed to incentivize certain types of work that benefit our society. As for the math of it – I don’t know if I would take the PSLF program right now. It feels uncertain in this administration, I know there has been talk of canceling it (and have to admit I don’t know where that stands now). But I think this is sort of avoiding the major issue of why your budget has blown up so much, aside from the IRS stuff. How can you get back to a point where you can still make your minimum payments? I know there were some questions about your money vs your husband’s money on the last post, but how on board is he with the debt journey? Can he do anything more to help? Yes, that is the big elephant in the room! Your budget has “blown up so much”, and I don’t believe we really know why. Did I miss something in your posts that offered an explanation? Maybe we saw some numbers, but I don’t believe it was shared what all the credit card debt really went to. Maybe I am wrong. I, too, would avoid the PSLF program at this time and with this administration. The goal has to be to find a way to get back on track, meeting your monthly obligations on your current debts and holding the line on any new debt. It seems your husband is simply going to have to do more until the dust settles. Constantly trying to juggle the numbers on income that does not exist is not working for you! Perhaps he should think of going to school part time for a while and working more hours? Ashley’s budget has blown up because they made the decision to have her husband quit full time work and go back to school just a few months after buying a house. At the same time Ashley took a higher paid primary position that required her to drop her second job. While these may all be good long term decisions (investing in a home, investing in her husbands education, advancing her career) they all occured too close together. Now the budget numbers just don’t add up, and Ashley will essentially be adding debt until her children are in school full time next year. I would like to point out that the cash flow issue is temporary. As someone pointed out the other day, your childcare costs will soon decrease. As you pay debts off, you will have more money available. I think you will get to the point where you don’t feel suffocated by the debt but it will take several months. A big plus of the PLSF is that it’s based on AGI. The lower you can drive your AGI the lower the payments. Once you have all your credit card and IRS debt handled, you could redirect those payments towards pre-tax retirement (thus lowering your AGI). In turn, your PLSF payment amount will go down even more. Saving you more money in the long run because more gets forgiven. It allows you to save for retirement earlier to get those compounding returns. Frankly, I didn’t know you qualified for this and you should have signed up years ago! Unfortunately you won’t be able to get retroactive payments, and it may be a moot point once your DH gets an engineering job. But then you could both be maxing your retirement! As i understand REPAYE taxes you on the forgiven amount. PSLF does not. It doesn’t sound helpful in the long run for you to consolidate and aim for PSLF. If you already know your interest rate will increase, it just doesn’t seem worth it. Your budget/income issue right now can and will improve. I did consolidate, before I knew any better, and overall it didn’t impact my interest rate as much as it sounds like for you. I’m not officially aiming for PSLF, but if I was I’m about 4 years into it. I am in the NHSC and receiving loan repayment. It’s a much shorter term period than 10 years! Currently, my consolidated loan payment is lower than the interest I accrue each month. While I am taking advantage of that low payment and focusing on other debts, it doesn’t actually help us to have increasing interest, and that’s even after receiving $50,000 through NHSC. I’m not American so the whole debt forgiveness thing is over my head. I’m just chiming in to ask about your husband. How is his work going? I think he got the certificate he needed to get work at the gym – how has that panned out? Are you ok? You are still under a lot of pressure and having to make decisions like these can’t help. Have you scheduled an appointment to meet with a CPA/tax preparer to complete your 2017 return? I think that should be your priority to find out your tax liability after your change in salary at the university along with less income from the extra courses you taught and your husband’s business. You should also get tax planning advice to be sure your tax withholding for this year is correct, because of the changes in tax laws for 2018 and since your husband is earning money again. I think you should focus on budgeting and understanding your expected taxes before you make any changes with your student loans. Clarifying your tax situation and possibly putting more in a retirement account (for you or your husband) may provide you with better cash flow to handle your debt payments. If you are making you are making the standard payment while doing PSLF, after making payments for 10 years, you’ll have paid back the principal, and then some. You might not pay back that principal if you’re doing IBR, and not making much money. But after a few years of working you’re probably going to be paying enough that you pay back that principal. So you’re not robbing your lender of any money. I didn’t do PSLF, because not all of my jobs would have qualified me for PSLF. I worked at a qualifying place, then a non-qualifying, then a qualifying. I did consider it because my loans were large enough that I was on the 20 year repayment plan. I think this program works best for people like elementary teachers, where your gross income is low, therefore your payments are very low. It sounds like you are going to have a six figure income already, and when your husband returns to full-time work it certainly will be higher. Just remember, if something sounds too good to be true, it probably is. You have mentioned what a pain it is to deal with these loan people, imagine how much trouble it is going to be to get them to write off your debt! No way would I agree to obligate myself for 10 more years in hopes of some forgiveness at the end of that time. Don’t let your short term money needs dictate your long term financial plan. I say consolidate. Lock in your payments to help your planning. But I’d recommend you look around for a better rate. I don’t know what your credit score is, but I just consolidated my loans through my credit union 2 weeks ago at 3.24% fixed, which dropped to 2.99% when I set up my auto payments. This was for a 5-year loan of about 29k. I’m not using loan forgiveness, because my federal loans will be paid off before I qualify. I only consolidated my private loans. Also, if you consolidate, and then your financial situation improves there’s nothing stopping you from paying extra toward your loans later. If it saves you now that helps you now. You can always throw more money at it later and avoid the extra interest. I know nothing about student loans but I wonder if a bank would be better. First Republic Bank seems to have rates from 1.95% to 3.95% depending on the term. Also, I think you get to deduct $2500 in student loan interest per year. You will lose that deduction if you refinance with a bank. You will not lose your deduction refinancing with a bank! As long as the loan type is a student loan refi the interest will still count as student loan interest and be deductible. Before you the forgiveness check out the reviews of the company you have to use to consolidate that was enough to make me decide against it.